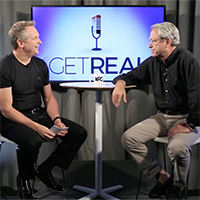 Keystone Partners Group is honored to present the “Get Real” show, where Operating Partner Bob Wells interviews iconic real estate agents who dispel the myth and the mystery surrounding the achievement of massive success in the real estate sales business. The “Get Real” show exposes the models, systems, and tools that you must master to create a highly-leveraged business and manifest the lifestyle that you’ve been dreaming of. When would now be a good time, to Get Real. Having built a relationship based business that has consistently generated $35-$40,000,000 in annual sales volume, Gary Segal is an icon in the real estate world, yet his true level of mastery remains hidden from the casual observer. Not only has Gary built an awesome sales practice, he’s also created financial freedom through multiple streams of passive income, and leveraged his business in a way that will allow him to step away from it while continuing to receive significant income from its ongoing performance. Listen to Gary as he gets real and shares priceless perspectives on abundance, strategy, and, mindset.